The story of the outlaw hero Gisli is one of my favourite of all the Icelandic sagas. I can’t be sure why this is, but it may be due to the compact and well-crafted structure and style of the work – it certainly strikes me as one of the better sagas from a literary point of view. It may also, or even more so, be due to the realism and relevance of the story, the family orientated drama of which, apart from an exaggerated comic interlude and a bloody climax, could be transposed almost without alteration to modern Western society. And Gisli himself is a strangely magnetic character, apparently straight-forward but hiding complex depths and paradoxes – a warrior and a poet, sometimes a friend to the friend of an enemy and sometimes an enemy to the friend of a friend, a murderer and yet clearly a good man. Einhamar, where Gisli was killed. I began my physical journey into Gisli’s saga on a rainy Sunday morning in late August, and I began it in the middle of his story, with the comic interlude. 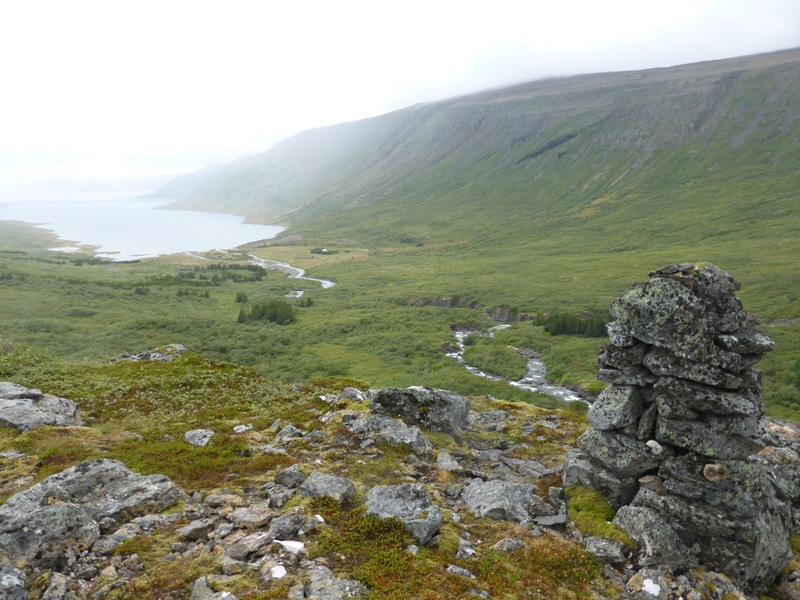 Somewhere in the drizzle and fog around the ferry that was taking me to the Westfjords was an island on which Gisli sought refuge with a friend some years after he had first been outlawed. His friend had an idiot son, a giant of a man who, in line with the highest humanitarian standards of the day, lived outside, ate grass, and was kept chained to a heavy rock with a collar. Gisli made good use of this circumstance one day when he was caught out at sea in a little fishing boat by his enemies and fooled them by playing the fool. While his host rowed quickly to the island in another boat, convincing Gisli’s would-be killers that he was in that other boat, Gisli rolled around in the fishing nets and even jumped overboard a couple of times, still wrapped up, and was dragged along through the water. His enemies thought this was hilarious, but their leader called them to order and they rushed off to the island, allowing Gisli to make his escape. It didn’t take the astonished and then furious villains long to realise their error, and in their larger boat they caught up with Gisli just as he reached shore and disappeared into the woods, across the bay from where the ferry dropped me at Brjánslækur. 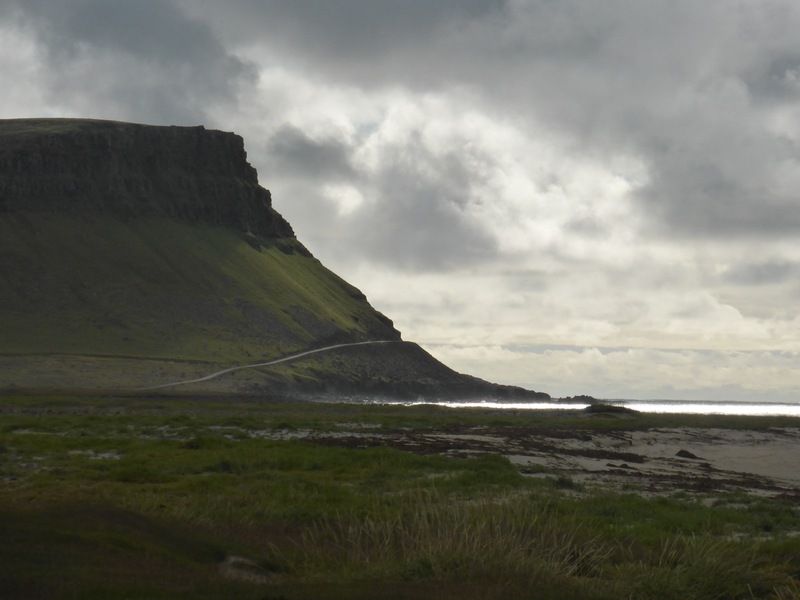 I spent the rest of that day doing ‘normal’ sightseeing, having got a lift with a young Israeli man who was pleased to have company as his little car bumped and juddered its way along more than 40km of rough dirt road to Látrabjarg, and the same back. 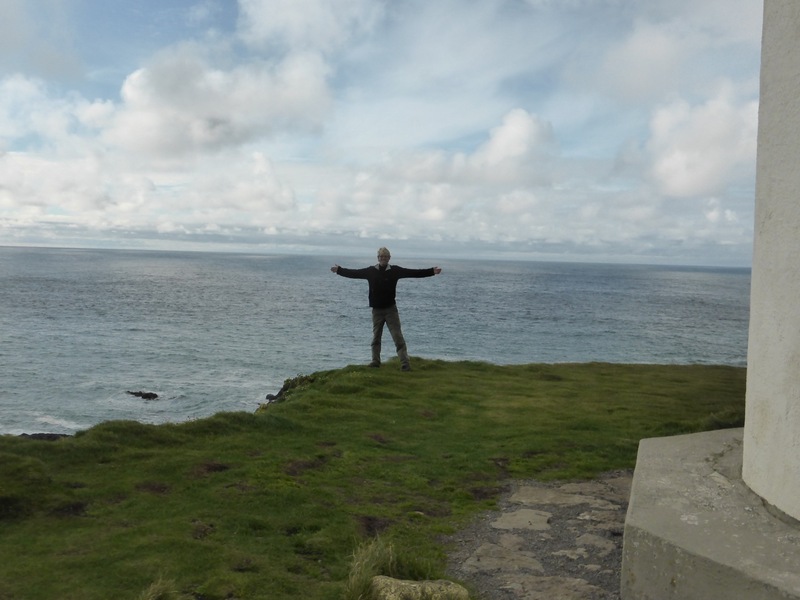 In the end we had to abandon his vehicle, and hitch a lift with a local in a big 4WD for the last five kilometres to the end of the peninsula, Iceland’s (and, excluding the Azores, Europe’s) most westerly point. That night when I was about to get my tent out I was lucky enough to be invited to stay with an elderly couple in their holiday cottage in Bíldudalur. 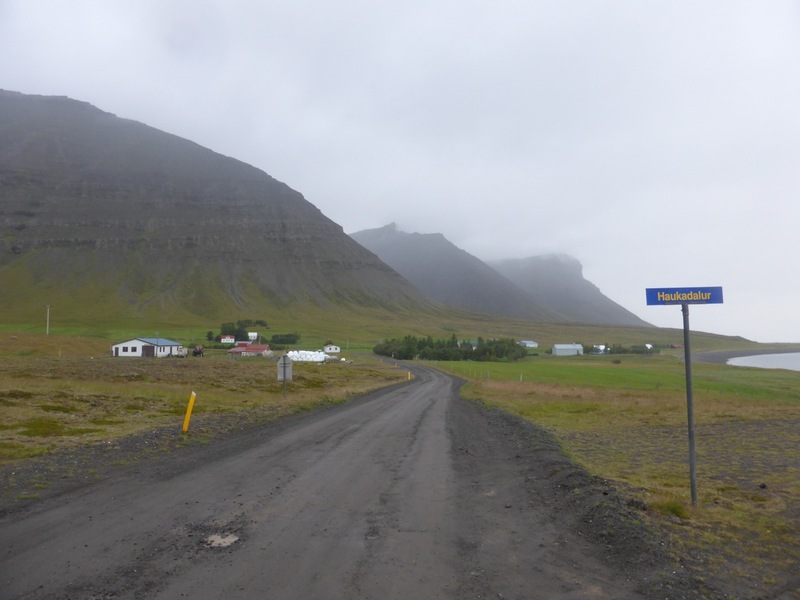 This turned out to be doubly fortunate, because although they now live near Reykjavík, they were originally from this area and were able to give me a good indication of where I could find the site of Gisli’s death, and how to get there. So the next morning that is what I set out to do – but for the sake of the story I will skip ahead for now to the evening of that day, and the events and setting that precipated Gisli’s outlawry in the first place. By a fortunate coincidence I had met my Israeli friend again at the spectacular Dynjandi waterfall, a blessing for both of us as Dynjandi is definitely a place you need a friend to take photographs of each other, though even so it is hard to get an idea of the overwhelming scale of the falls. 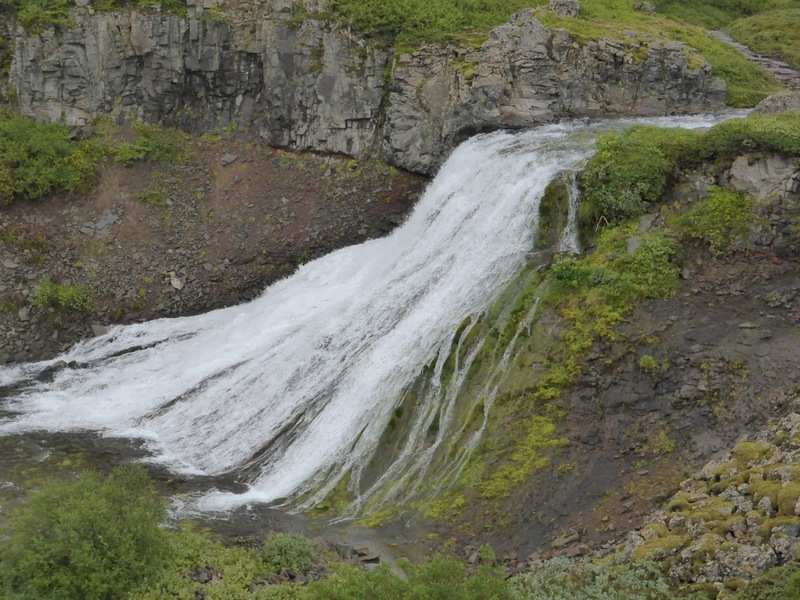 He drove me to the end of the paved road by an airstrip west of the little town of Þingeyri, and after hiding my rucksack by the side of the road I jogged the couple of kilometres to Haukadalur. 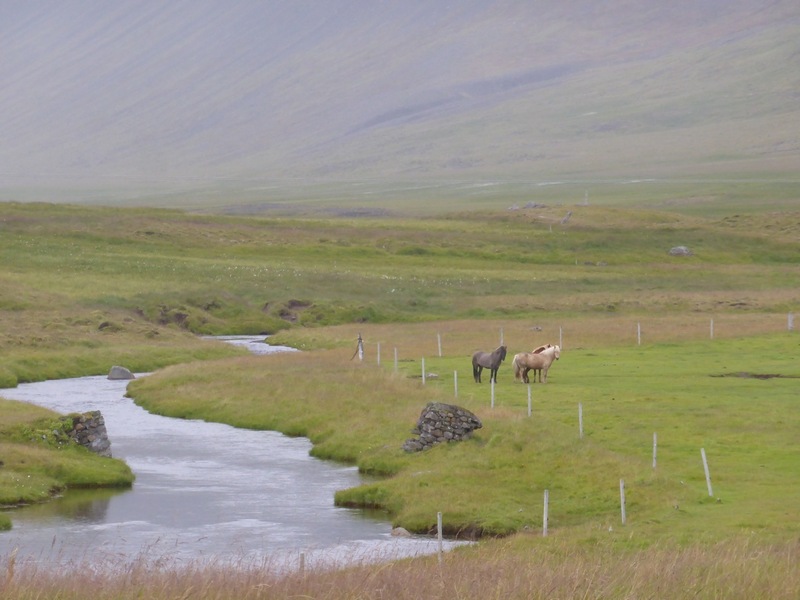 In this peaceful valley the two brothers Gisli and Thorkel shared a farm, and a couple of hundred metres away across the valley lived their sister and brother-in-law – all very cosy. Thorkel was particularly good friends with his sister’s husband, Thorgrim, while Gisli had a good friendship with his own wife’s brother, Vestein. The four of them together made a fine show when they turned up at the local assembly, but a rumour spread that they were not such good friends as they appeared to be. To quash this rumour they undertook to swear an oath of brotherhood all four, but this oath became the first serious crack in their friendship, for at the critical moment Thorgrim decided it would be enough trouble being so bound to his brothers-in-law and that he had no obligation to Vestein. He withdrew his hand, and Gisli then did the same, refusing to tie himself to a man who had rejected his own best friend and brother-in-law. The prophetic rumour had become self-fulfilling. Things became properly complicated when Thorkel overheard his wife and Gisli’s wife accusing each other of having been romantically involved each with the best friend of the other’s husband. When Gisli heard about this he only shrugged and left it to fate to decide, but Thorkel kept his council to himself. At that time Vestein was away voyaging, so all that happened was that Thorkel decided to move out and live with Thorgim across the valley. To cut a long story short, when Vestein returned to Haukadalur he stayed with Gisli; one night a great storm struck, threatening the house and haystacks, and in the confusion someone slipped into the house and thrust a spear through Vestein as he lay in bed. Though nobody declared responsibility for the murder, Gisli’s brother-in-law Thorgrim dropped a few hints that he had been involved, and some time later Gisli crept out one night, down through the hayfield and across the stream, and into his brother’s house. He killed Thorgrim secretly and escaped, but he too was not careful enough with his words afterwards, and when it became apparent that he was the guilty party he was outlawed and doomed to spend the rest of his life on the run. The site of Gisli and Thorkel’s farms, with the stream and hayfields between. Gisli survived as an outlaw for thirteen years, longer than anyone except Grettir the Strong, but for the last seven years of his life he was plagued by dreams in which two women came to him, one good and kind, the other terrible and always smearing him with blood and gore. In the dreams seven fires were burning, and Gisli understood that these represented the years left to him. 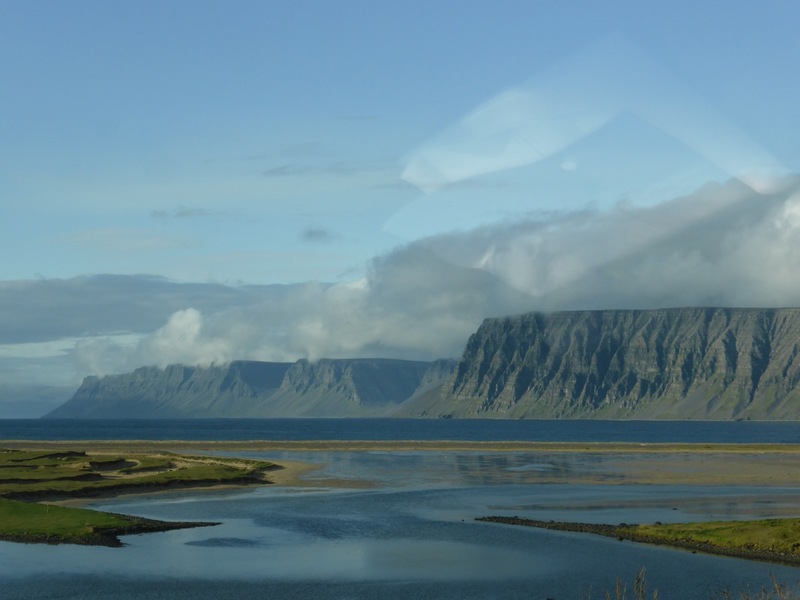 When the seven years were up Gisli was staying with his wife on a farmstead she had established in the remote valley of Geirþjófsfjörður, where I arrived on a Monday morning a good thousand years later. The road runs around the top of the valley, and the valley sides are steep and rocky at first, and then boggy and wooded further down. Crowberries and bilberries grow in abundance, and the scrubby willow trees form a thick natural barrier three metres tall, all soaking wet on that morning. But I could see poking out through the trees a great slab of rock that I just knew was Einhamar, on which Gisli fought his heroic final battle. A cairn on top of the rock was the best indication that this was a place of significance, but when I climbed up onto the rock I could see how well it matched the description in the saga. 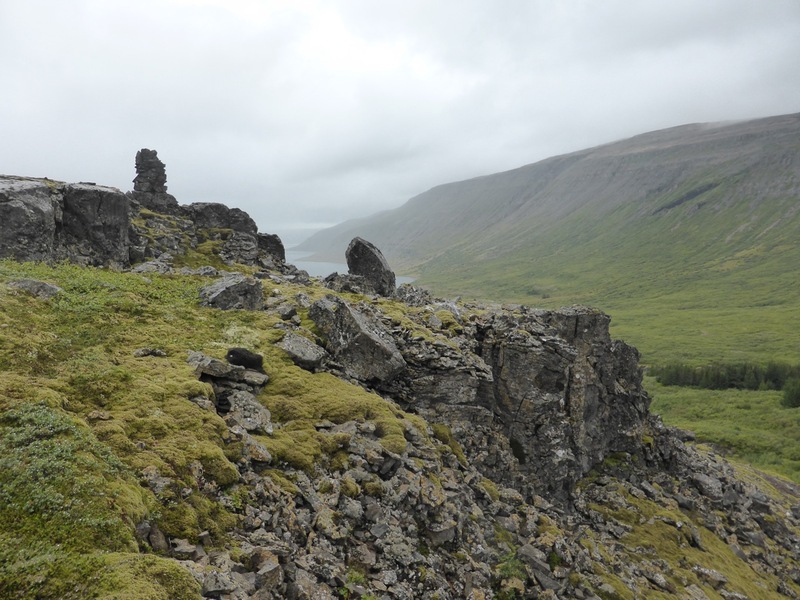 Down below is a steep ridge where Gisli first turned on his fifteen attackers, and then on rough cliffs several metres high rises the crag Einhamar that he suddenly scrambled up onto to resume his defence. 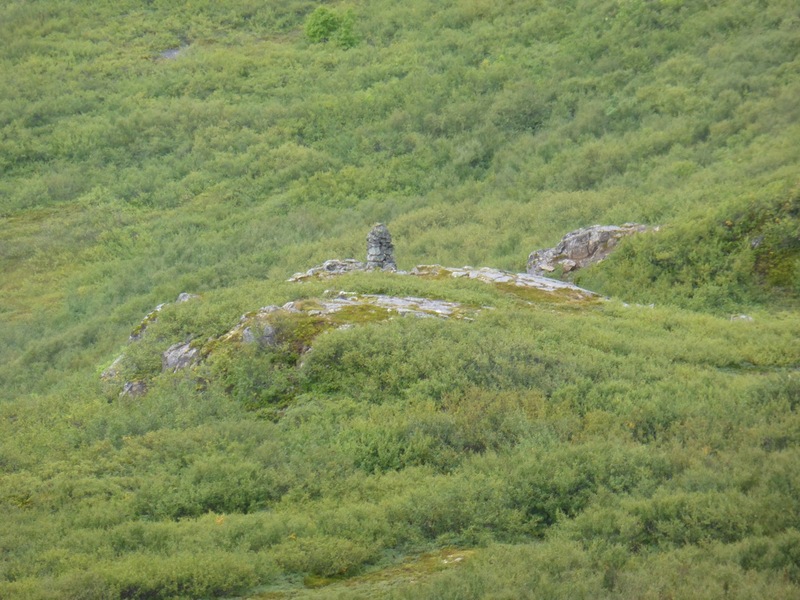 But it wasn’t just the cairn or the physical resemblance to the story that persuaded me that this was the very spot on which Gisli bravely met his fate; there was something in the atmosphere of the place. 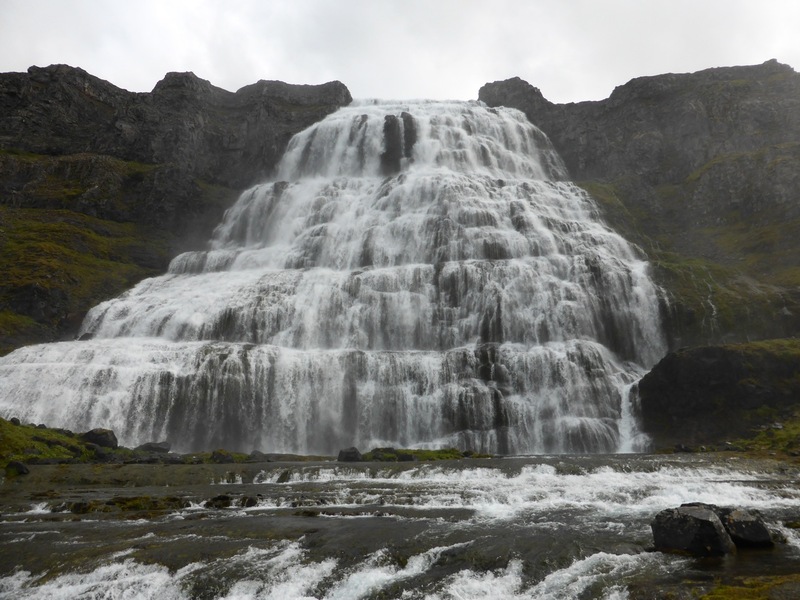 With a beautiful waterfall running past the crag, the mountains above and the fjord below, it is a truly special spot, remote and apparently untouched by the passing centuries. 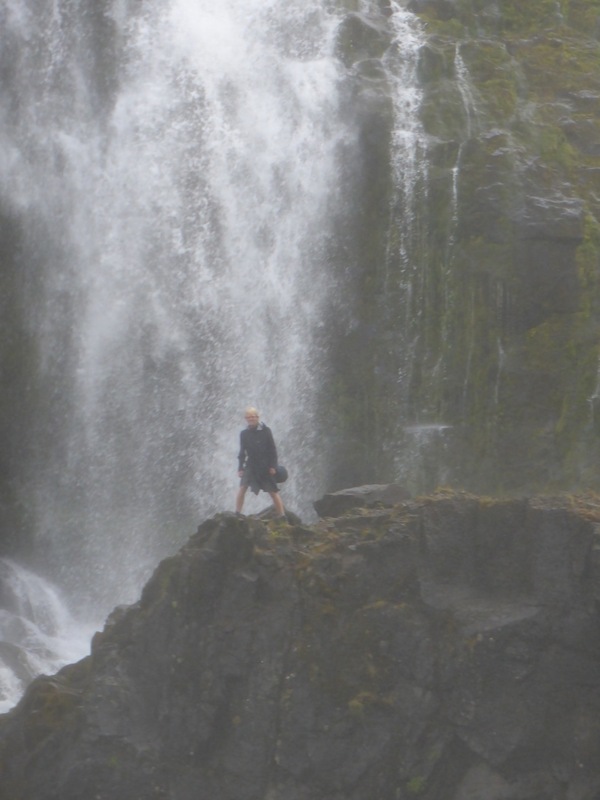 There more than anywhere else in Iceland I felt a direct connection to the world of the sagas, and to Gisli himself, and that place and moment alone made the entire journey worthwhile.